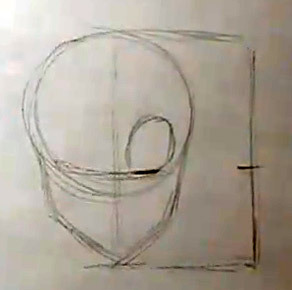 Start off with an upside down egg shape like you have learned in one of our previous videos. Find the middle point along the vertical axis of the head. This is where you will eventually draw in the eyes for the character. 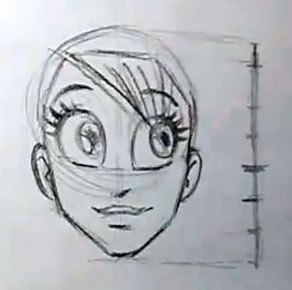 To follow along with this style of head you can draw in the inner most part of the eye right on this horizontal line.The upper eyelid should be drawn higher than the eye line, while the lower lid dips just below it. Leave about one eye width worth of space between the eyes to position them correctly on the face. 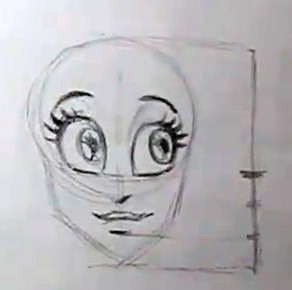 What we mean when we say this is that if you were to draw 3 eyes side by side with exactly the same size, and then removed the eye in the middle, that’s the correct amount of space that you need to have between these eyes. Next divide the lower half of the face into thirds. 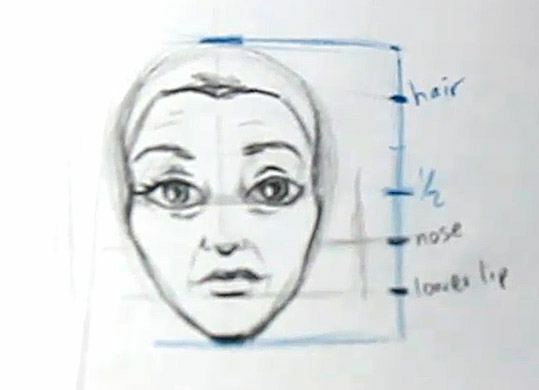 This is a very good approach to drawing the features of the face because it doesn’t get into too many complex measurements so you are able to work quickly and not worry too much about getting caught up in the details. As you become more familiar with drawing the human face you’ll favor more of these time saving techniques because they will give you what you need for the basic shape and then your experience and knowledge of the face will allow you to fill in any blanks that you need to work quickly while still producing great results. The first third that you divided will be for the lower tip of the nose. The second third that you drew is where you will make the ridge of the lower lip as it changes from the lip into the chin. This area is almost always in shadow when drawing with conventional lighting sources that come from over the character’s head. Now that you’ve defined the lower lip, you can add the upper lip on top of it. Remember because you are drawing a female to incorporate a prominent curve in the top middle of the upper lip. Finish off the upper lip by adding some shading to it. Now as you move onto the jaw you will want the lines that frame the lower part of the face to taper in towards the chin. This is a characteristic of the female form. You don’t want to let the jaw get too square or boxy because then it starts to take on the qualities of a male face. As Laurie gets into drawing the eyes she has some really great advice: “If it looks wrong, it’s probably wrong.” This is really true, but if you find that you are having trouble with a particular part of the face don’t worry about it too much. Just realize that it is an area that you need to improve upon and then practice drawing only that part until it starts to come naturally to you. A lot of people will get stuck on this because they don’t want to put in the time to practice a small detail. Don’t be like those other people – take the time to improve on the areas that you are weak at, and over time you will see some really amazing results. Add in the middle of the hair line by diving the top of the head into thirds and then letting the hair start to come out of the second third of the head. That’s it for drawing the realistic proportions of the female face. Place the eye line a little bit lower than drawing a realistic character to follow along with Laurie B’s own style of drawing females. Her eyes are approximately the same size as the entire eye socket in the skull of a realistic character. Divide the lower part of the face into 3rd’s again with the top most division forming the bottom of the nose, and then the next divided part lining up with the bottom of the lower lip. In this picture you can also see that the eyebrows have been added to the eyes. If you’re not sure where to place the eyelashes you can start at the inner most point of the eye where the upper and lower eyelids meet and then draw an imaginary line that goes diagonally up towards the top outside corner of the eye and this is where you should place your eyelashes. Attach the ears to the head at the corners of the eyes at the top, and then at the bottom of the nose for the bottom of the ear. 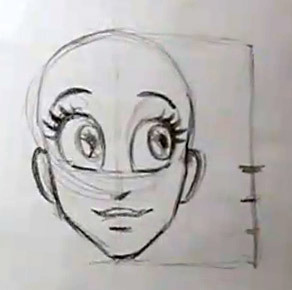 To find the hair line on the cartoon female drawing you can divide the head up into 4ths and then take the top most division and use that as you line where the hair will start.